Choosing the right bat is essential to the success of a softball hitter. It is very important to choose a bat that is the right weight and length for your body type. The type of bat is really just your personal preference. Almost all bats you can buy today are very well-made with a lot of research and technology involved in the making process. Most fastpitch bats are between 28 to 34 inches long, you should choose depending on your size. The weight is also an important factor. The largest bat that you can purchase is 34 inches long and weighs 26 ounces. That’s the heaviest and longest that is used for fastpitch softball. The difference between the length and the weight is called the drop. For instance, a bat that is 33 inches long, and 23 ounces, is considered a minus 10, or a 10 drop. Fastpitch softball bats are usually used in Fastpitch Leagues by girls from age 5 up to the professional players. Regardless of the type of bat you choose, you always need to check if the bat is approved by the league you are playing in. When picking out the bat, it’s important to find one that isn’t too heavy. You should be able to control the bat without your hands collapsing. If you can hold the bat in front of you and swing it back and forth without dropping it, this is a good sign that the bat is not too heavy for you. If you’re playing on a team, ask some of your teammates if you can try theirs. Try different sizes and lengths, and see what feels right to you. Also, you can go to the store, hold and swing several bats, and feel how they are. When choosing your softball bat, make sure you find one that you can control, with the perfect weight and length. Even the best fastpitch softball bat needs a little bit of breaking in from the player. This means that you need to use the bat during practice so you get used to it before bringing it into a serious game. There are bats that don’t require a lot of practice before a game and there are bats that need more attention from you in order to break it in. The half and half bats which are made from a combination of aluminum and composite material: these are actually the new hit in the world of softball bats. One piece: made out of the same material from the barrel to the handle which allows the bat to be stronger and stiffer. This bat is designed for power hitters who don’t need flexibility in their bats and can cope with the vibrations. Two piece: made from two pieces – the barrel and the handle. This bat offers a lot of flexibility and absorbs the vibrations. Why is it important to choose the right fastpitch softball bat? You will see an improvement in your game as soon as you manage to break in the bat. You will be able to hit the ball with much more force. A good fastpitch bat is going to challenge you to improve your swing and your hits. It is also durable and you won’t ever see it break in two pieces on the field. They are made to be resistant and they can sustain great forces. 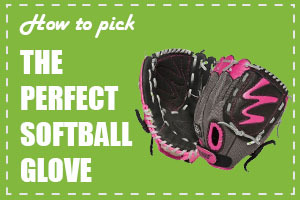 Read about other softball equipment: More about womens cleats for softball or about the best girls softbal gloves.